One word uttered right at the beginning of Gnomeo & Juliet — an animated update of Romeo and Juliet — absolutely scuttles the entire cinematic exercise: "boring." That's the descriptive the film uses in reference to William Shakespeare's prologue to his play ("Two households, both alike in dignity ... ") before a narrator begins reading it. In the movie, the lines are jovially cut off, so that the animated spectacle can begin proper. It's intended as an applause moment. The message is that the play is unsuitable and inscrutable for today's young minds. The irony is that the prologue is choked off before its entreaty to the audience's "patient ears" — something the play goes on to earn, of course. The tragedy is that Romeo and Juliet is one those familiar source materials ever ripe for new generations of kids to relate to, and an animated retelling isn't the worst idea ever. But the film jettisons the time-proven poetry Shakespeare oozes ("Arise, fair sun, and kill the envious moon") and embellishes the tale instead with, you guessed it, modern pop-culture references. Gnomeo & Juliet includes cinematic references that bristle with relevancy, including The Matrix, Saving Private Ryan, and American Beauty. And considering the film is chock-a-block full of hoary Elton John tunes, one wonders: Just why do the filmmakers think nods to movies and music from before most of the core audience was even been born are going to reverberate? 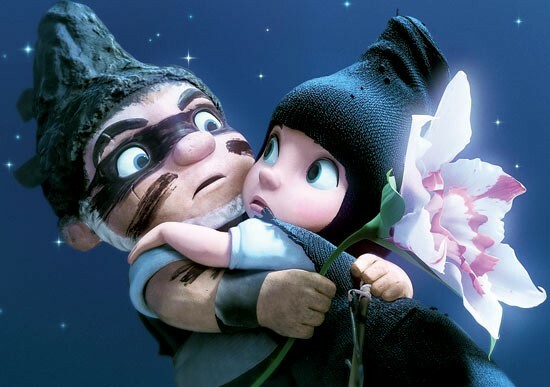 The answer is that Gnomeo & Juliet is an intensely cynical cash grab. What else might one expect from the director of Shrek 2 (Kelly Asbury) and nine writers, not including Shakespeare? For what it's worth, the movie is not without some rewards, though maybe not everyone will get as much pleasure out of the little porcelain plink when two gnomes touch hands. And, for the record, my 6-year-old daughter liked Gnomeo & Juliet. She wonders when it's going to come out "on DVD and Blu-ray" so we can buy it. Gnomeo & Juliet is not showing in any theaters in the area.